It has been a quiet week in the parsonage, notwithstanding the lack of cooperation from Mr. Weatherman. As the thermometer dipped, I ducked inside and sought the warmth of my easy chair. Since coming to Florida, my blood must have thinned to anemic levels. I know cold is cold -- but I have been freezing my dignity off. It has been so cold my teeth have been chattering so much the good Mistress of the Parsonage made me take them out of the glass next to our bed. It has been so cold my shivers have been wearing sweaters. It has been so cold my unborn great-great-grandchildren have begun to shiver. "Don't get yourself down," my wife said, "it'll all be over in a week or two." That is the great thing about living here in Florida. Winter may last three weeks and then it is back to the good old sunny days the Sunshine State is known for in the North Country. It is why I moved here in the first place. This kind of thing is to be expected in the merry old month of January. I don't know just how many Januaries there have been throughout time, but each one signals the beginning of something new. Despite the few cold days to be endured in January, there is something to warm the heart of everyone. January means "the old is over and the new is here." Nobody has ever taken the time to fully explain to me just what the "new" is, but I, along with billions of other people throughout the centuries, have reveled in starting something new. Regardless of how bad the "old year" was, the "new year" promises to be so much better. January is the time for thinking good thoughts about yourself and everything else, for that matter. You know it's the New Year because you feel good about your New Year's Resolutions. In January, few people have had time to break their New Year's Resolutions and feel pretty positive about keeping them. Given time (not much for some people), this elation will pass, but January is the time to celebrate good intentions. Not since Adam said to Eve, "Honey, this year I'm going to turn over a new leaf," have resolutions been so popular. Everybody does it, even those who swear up and down (just how does a person do this") that they don't. It is important to make a resolution if only to promise yourself that you intend to do better than you have been doing. No matter how good your life has been, the hope burning in every heart is, "I can do better." 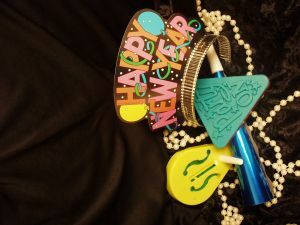 For myself, I have entertained some New Year's resolutions to enable me to 'do better." Allow me to list a few of my favorite resolutions. I solemnly resolve that during the forthcoming year, I will give up eating broccoli in every and all forms. I'm especially proud of this resolution. For the last 37 years this has led my list of New Year's resolutions and to my great credit, I have never broken it. Because of the serious nature of this resolution, I refuse to allow my guard to let me down. If the Good Lord intended me to eat broccoli, He would have made it taste like creamy chocolate. It doesn't and I ain't. I solemnly resolve that during the forthcoming year, I will eat no dessert before its time. It is crucial that each dessert be eaten in due time. In fact, I'm due for a little dessert right about now. My resolve for this coming year is to carefully monitor my Dessert Eating Activity, known simply as the D.E.A. factor. There should be some law somewhere forbidding people to eat dessert before its time. There are three factors to the D.E.A. factor: anytime, every time and all-the-time. I solemnly resolve that during the forthcoming year I will not give in to the inhuman compulsion to exercise. Every day of my life, I am bombarded with all kinds of enticements to get out and exercise. I have invested a lot of time and integrity in my "love-handles", and no slick advertisements will sway me otherwise. Don't these people know just how much it has cost me through the years to develop and maintain these "love-handles""
You know it's the New Year when you find yourself standing in the "Gift-Return" line at the shopping mall. I don't get many gifts that I don't like or need. However, I do have a few relatives who think it is funny or something, to send me gifts that I cannot use. For example, what relative thinks I wear an Extra-small sweater"
I won't say that the sweater Aunt Tilley sent me was small, but if I had two of them, I would have a nice pair of mittens. It is not that my dear old aunt doesn't like me, but she hasn't seen me in twelve years and still thinks I am 8 years old. The last time I saw her she asked me how I liked the second grade. Being the gracious gentleman that I am, I hated to shock her into reality and told her recess was my favorite class. She laughed and then pinched my cheek. Aunt Tilley has not experienced reality for so long we all fear the shock would kill her. You know it's the New Year when you find yourself reading the first book of the Bible. Many people, with good intentions, start the New Year off right with the determination to read the Bible all the way through " a good thing for everyone to do. I make it a priority to read the Bible through at least once each year. No other book could ever do anybody more good than the Good Book. In fact, there is a special blessing offered to everyone who reads the Bible. "Blessed is he that readeth, and they that hear the words of this prophecy, and keep those things which are written therein: for the time is at hand" (Revelation 1:3 KJV). Make this New Year the best year of your life by putting God first in everything.